"The Pacific" is the third part in the history of World War II, as brought to you by Tom Hanks and Steven Spielberg. "Saving Private Ryan" is one of my top 10 favorite movies of all time and I would argue that "Band of Brothers" is the best mini-series I've ever seen. So, "Pacific" had some big shoes to fill. This installment follows three Marines in various stages of their tours in the Pacific and the horrors they had to deal with. One is a war hero, one an idealist whose beliefs are brought into question, and one a disillusioned veteran who has a harder time than most adjusting. Each sees a terrible slice of action that indelibly affects the course of their lives. When the Japanese attacked Pearl Harbor in 1941, thrusting America into the throes of World War II, the country undertook a two front war, fighting one war in Europe and a much less heralded war that spanned the Pacific ocean. Though both fronts brought their own unique hazards, in many ways the fight in the Pacific was a more difficult battle, yet for some reason it always seems to be the forgotten war. When we studied WWII in school, almost all the focus seemed to drift toward D-Day, the Battle of Normandy, etc. and very little time was put into the Pacific beyond Iwo Jima. To this day, when I think of WWII, I think of the European front. Unfortunately, "The Pacific," didn't do much to help the disparity. It's really not its fault. How do you follow up one, let alone two, of the best productions of the last quarter century? The answer in this case is you really don't. Don't misunderstand. 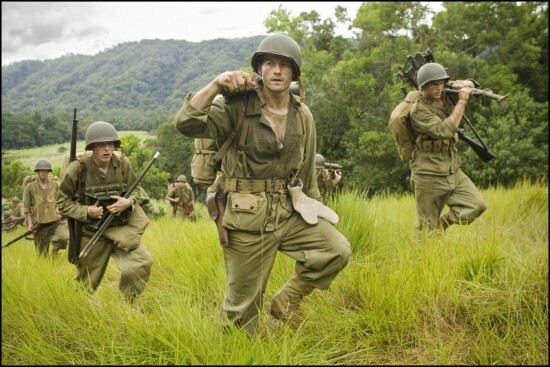 As far as war movies/shows go, "The Pacific" is still very good and completely worth seeing. It just doesn't measure up to its big brothers. It doesn't transcend the way "Ryan" and "Brothers" did. The stories are still just as real, the cinematography and shot selection are astounding, and the dialogue is great. Two things hold "Pacific" back. One, for the first time in this franchise, the realism went a step too far. Despite all of the horrible events and details depicted in "Ryan" and "Brothers," never once did I feel like they were anything but authentic. "Pacific" at times almost seems gratuitous, like it wants to be shocking, which is the opposite of what I've come to expect from this collaborative group. Two, there is a distinct lack of brotherhood among this group of soldiers. For me, the predecessors of "Pacific" are what they are because of the bond shared and exquisitely displayed by the cast and the characters they portray. The emotional connection of the audience to the characters is rooted in the fact that there is an even stronger emotional connection between those on screen. The very idea behind "The Pacific," three tales of three different Marines, leads to a disconnect that lessens the impact that the series could have. It still tells a tremendous story and one that desperately needs to be told, but it just isn't as engrossing as the other installments.